Not far from the city of Honolulu on the Island of Oahu, is a secret gem of ancient Hawaii, waiting to be unearthed and shared by those who look within and connect. Many people may never be able to personally visit the major sacred sites of the planet, but many people get to Hawaii sooner or later, and Hawaii is filled with sacred sites that have powerful energy and are free to visit. 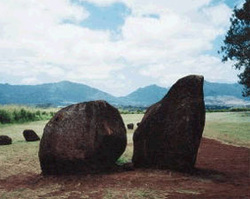 Although the stones have been moved from their original location, they were used by the Royal Hawaiian family, Kahuna’s and others for healing purposes and vibrational attunement. As I walked to the enclosure of the stones, I could feel their powerful energy at least thirty feet from the enclosure. (What lucky children who attend the Rainbow School!) There are three beautiful healing stones set in a small mausoleum. An iron gate does enclose the stones, but it is unlocked and you can easily open the gate and touch the stones and commune with them. In the presence of the stones and spiritual guides that surround them, one connects with their sacred energy and love vibration that offers healing and transcendence. The stones enjoy being honored and recognized. Like all sacred sites in Hawaii, it is appropriate to bring fresh flower leis, fresh picked flowers, fresh fruit, incense, Kava, loose tobacco and the like, placing them on or around the stones. Every visit to the healing stones was different for me, but I could tell they are much loved and honored. Each time I came the stones were decked out in fresh and varied offerings. During one visit I read that the stones desired rainwater from the healing night rain to be showered on them. Since the stones are now in a covered building, they no longer receive the cleanse from healing rains. So it quickly became my mission to bring healing night rain to the stones. Evening would come and I would put out a large pot outside my cottage to collect the night rain. As soon as my pot had caught the manna from heaven, off I would go the healing stones with my sacred offering of healing night rain. Blessing the stones with night rain made me feel even closer to the stones, their energy and the Hawaiian people, of both the past and present. As I splashed the water over the rocks their love and healing became a part of me. 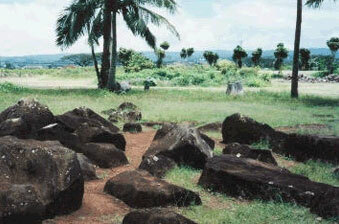 Kukaniloko or The Royal Birthstones is another wonderful sacred site not five minutes from the healing stones. This site was used by the Royal Hawaiian family for birthing royal members and their extended families. Whenever possible, royal families traveled to this site to give birth, even traveling from other islands to do so. A royal birth was a sacred event, and attended by important chiefs and spiritual Kahuna’s who helped usher the new being into this world. Power and blessings were endowed to those who were born on this site. As I entered the site, I was struck by the two standing stones at the gateway of the area, so reminiscent of the Avebury stones, yet half a world away. The actual Birthing Stones are within a copse of trees a few hundred feel from the entrance. The stones under the trees are numerous and of varying sizes and shapes. Several are formed like basins or beds, and as I lay on them I was instantly cradled. The heat from the sun, which can be very intense and HOT, only warms the rocks with a deep gentle heat that relaxed every muscle in my body. Reclining on a rock I was completely at rest and comforted. One could easily see how this was the perfect area to give birth to a wonderful new spirit or to birth a new portion of your life. When I returned to my cottage after visiting the healing and Royal Birthing Stones, I lay down on my bed for a “siesta” in the heat of the day. I immediately had visions of a high hall of learning, and I wandered the afternoon in rapture of new teachings. Every island of Hawaii has its own magnificent share of sacred sites, as do all areas of the world. Treat yourself to them with a visit using respect and reverence for their energy. Share your spirit with theirs, and they will share a portion of their ancient truth with you, for we are all one.